One of the easiest ways to spruce up your home is the front entry. A new door mat and some fresh flowers are always a good start. But if you really want to up your game, take it a step further. 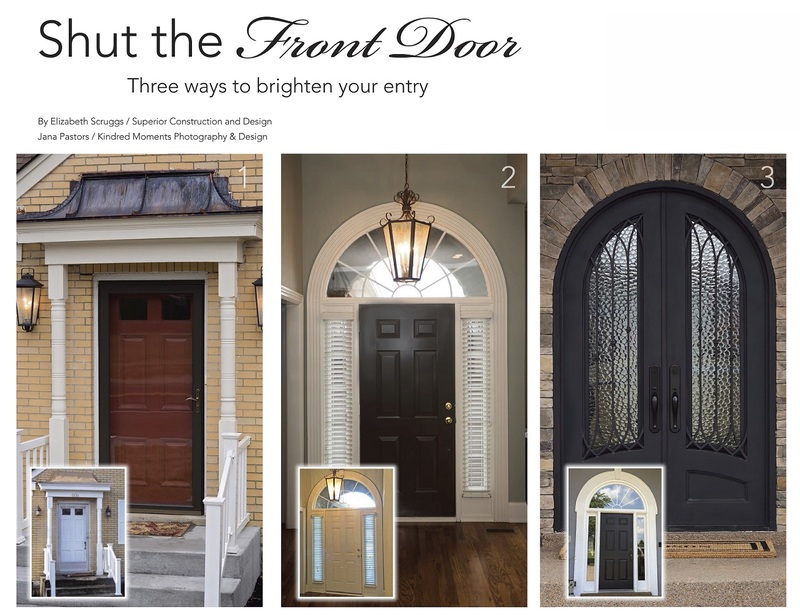 Here are three entryways we’ve recently designed—the changes range from a fresh coat of paint to an entire remodel. With this entry, we switched out the color of the front door, installed a new storm door, and added new lighting. When choosing color, it’s important to make sure what you choose has the correct undertones for the fixed elements of the home. Don’t forget about the interior of your entry! A simple color change can make all the difference. Take a look at how changing this door slab from builder white to a more intense color has now made the entryway a focal point for the room. With this entry, we installed new iron double doors and framed the entire front with stone. The new doors really make a statement and totally changed the facade of the home. As the new school year begins, thoughts always turn to fall. Cozy spaces, fall colors, mums and pumpkins these are the things that make us smile! As we begin to ready our homes for the season, many of us have holiday gatherings to plan. With that in mind, we thought we’d put together a few table-scapes to inspire you as you prepare for family and friends. This table was put together with many things I already had, and bet you do too. 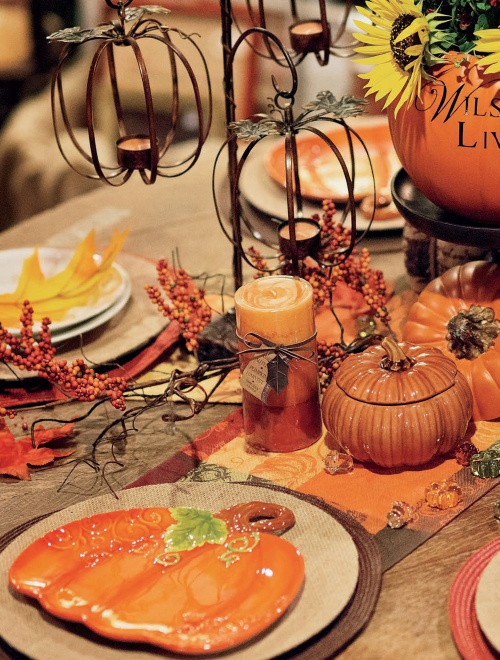 Using two runners along with some placemats and chargers, we set the table with fall colors. We picked up these great candle holders to compliment theb pumpkin centerpiece, which was made using die cut letters on a foam pumpkin along with fresh mums and sunflowers. This one was so fun to create! Created on a rustic farm table, we started with fabric and tablecloths to create the foundation. We added apothecary jars layered with Halloween candy, which is a fun and simple centerpiece to make. This table is my favorite because I love china, crystal, and shiny things! We were so fortunate to be able to create this table and our fall table at Antiques on 231. Using items found in the store, we created this beautiful, formal look. Notice that we mixed different patterns of china and crystal. The centerpiece was made using fresh flowers and artichokes from Kroger, along with some ceramic pumpkins and acorns. Many thanks to Jackie Chitwood and Teresa Lester of Antiques on 231 for allowing us to use their beautiful space and items to create the fall and Halloween tables. Please visit the store and help celebrate their one year anniversary during the month of September! This home and table setting will be featured in the Historic Lebanons 7th Annual “Tour of Historic Homes” on December 6, 2014. Contact Kim Parks with Historic Lebanon at 547-9795 for more details. Although I can’t wait for school to be out in May – I am equally as excited when pencils, crayons, and glue sticks begin to show up on store shelves again at the end of July. Similar to the beginning of the New Year in January, this “new start” comes with an endless array of multi-color pens and notebooks readily available in every store! For someone like me who still prefers pen and paper to a computer screen any day, it’s a veritable hey day out there! Begin: Begin this year with routines in place. All children, (and most adults!) function better when they have routine. Always: Always start each day with a good breakfast. My friend Mandy Pryor posted this a few years ago, and we love it: Muffins on Monday, Toast On Tuesday, Waffles on Wednesday, Thirsty (smoothie) on Thursday and Fruit on Friday. This works great, you don’t have to think about what’s for breakfast. Countdown: A fun thing to start a week or two before the first day of school is a countdown. Check out a week’s worth of books and read one each night before the first day. Another fun countdown is to make a paper link chain and tear off a link a day until the start of school. Children always love any kind of countdown! Keep: Keep the memories of your child’s school year with a first day of school and last day of school picture. There are many different ways to have fun with this. Take their photo by the same tree each year to watch how they each grow. Have them hold sign showing the grade they are starting that year. Have them make a serious photo, and then one with silly faces! Teacher: Give your child’s teacher a teacher questionnaire. Ask them questions such as: What is your favorite restaurant? Favorite scent? Favorite store? Favorite color? You get the idea. This comes in handy when the holidays roll around and you want to honor your child’s teacher with a little thank you. Organize: Organize a snack shelf in your pantry and/ or refrigerator. Have proportioned snacks such as goldfish, pretzels, grapes, and juice boxes, grouped together for easy reach when hungry kiddos get home. Supplies: There are an abundance of school supplies at great prices in every store right now! Stock up on paper, pencils, glue and poster board so you will be project-ready when you learn that your diorama is due tomorrow. Create: Create back to school traditions. One that I started with my girls the week before they started kindergarten is one we call “special days.” I spend the entire day with each of my children – one on one. They get to pick out whatever they want to do on their special day. We eat where they want, go where they want, and have a blast. The best part is we are spending quality one-onone time together! They look forward to it and start planning it at the beginning of summer. Homework: Create a homework station where everything is on hand to complete homework. I have an old Pampered Chef tool caddy (you know you have one too) that I fill with pens and pencils, rulers and glue sticks, scissors, colored pencils and erasers. I keep it in the kitchen, and when we start homework we pull down the caddy and are ready to go. Outfits: Now is the time to go through your kiddos’ closets and weed out anything you don’t need. Hang items together as outfits, so it’s easy for them to grab and go on school mornings. Organize: Have a designated place for book bags, coats and school items. Organize this area every night so you’re ready to grab it all and go in the morning. Lunches: I suffer in the school lunch department, but with the amazing ideas on Pinterest and Google, I have no excuse. Now is the time to create a lunch list so we won’t be scrambling the night before. If you have school lunch ideas that rock, please share on Wilson Living’s Facebook page with our readers!I need the help! Just remember, every effort you make to prepare beforehand, will be rewarded with less stressful mornings when the school years is in full swing.Here’s to a successful year! Have you ever felt overwhelmed by the amount of clothing and shoes that seem to accumulate in your home? Most especially if you have children the piles can grow, seemingly, overnight. With regular purging and organizing, you can keep things in check. These days there are so many options when it comes to recycling clothing. From consignment sales to online services to groups on Facebook if you take a bit time, you can find cash in your closet! 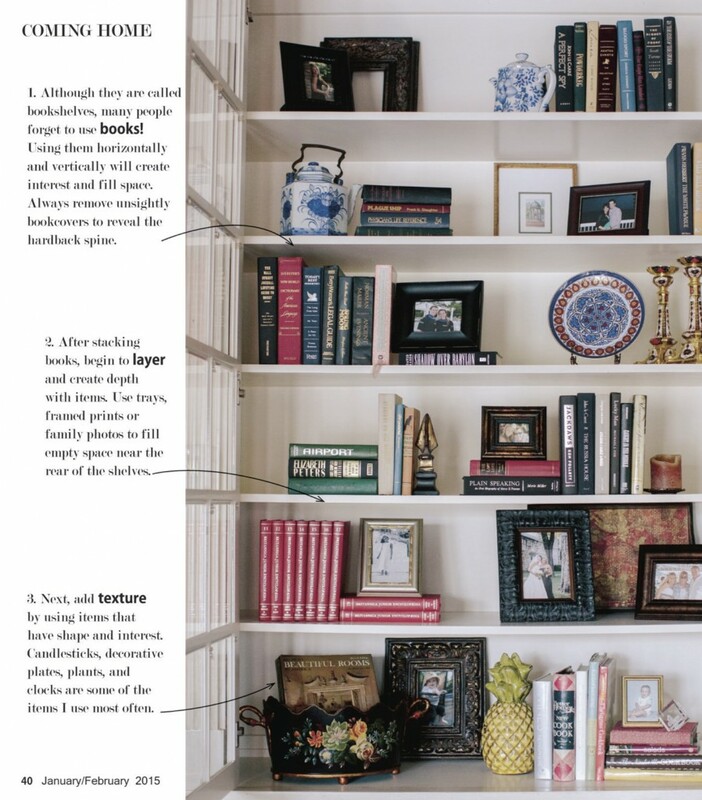 When it comes to closet organization, there are a few rules I always follow. • Be merciless in your purging. If you’ve not worn it in the last 6-8 months, you’re not going to. • Invest in good hangers. When you store your clothing correctly and keep it good shape, it will last longer. • Be very selective in your purchases.Better to have a few good pieces, than lots of things you don’t wear taking up valuable real estate in your closet. • Re-evaluate your wardrobe each season. It has been said that we wear twenty percent of our clothing eighty percent of the time. Keep this in mind as you are organizing. I worked with a client recently who felt totally overwhelmed with her closet. To compound this feeling, one of her shelves fell on Christmas day. To use her words, she was simply “afraid of the task,” and couldn’t face it. Here is what we did to get her back on track. First completely empty the space. 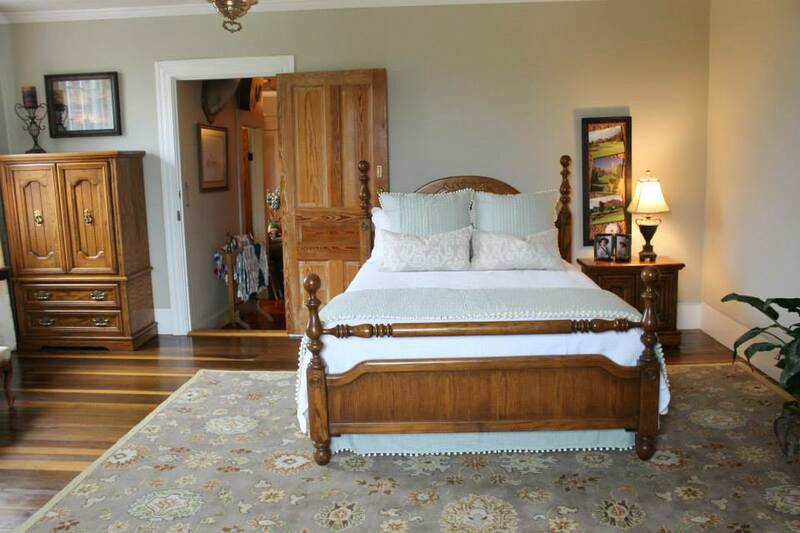 Next, thoroughly clean the space by wiping the baseboards and vacuuming. Then go through things item by item. They only need to go back into your closet if you have worn them recently. If not, they go in one of your sorting areas. After two hours, we had her closet in tip-top shape. As you can see, she has lots of space left in her closet. Most times we think we don’t have enough space, when actually if we are organized, we have more than we need. Next – This is the part I like, this is where the cash comes in! To get the best price possible, items need to be clean and in very good condition. Always inspect for stains or holes before listing your items for sale or putting them in a consignment sale. I’ve built my children very respectable savings accounts just on their consigned clothing. It takes a little bit of time, but the freeing feeling you get from being organized is wonderful and the extra cash never hurts! When you hang it in the closet, turn the hanger backwards. When/ if you wear it, hang the hanger back the correct way. In six months, if you still have any backward hangers, get rid of those items. If you’ve not worn it in that amount of time, you’re not going to. These sites are very easy to use. I’ve personally used thredup.com and it was simple! 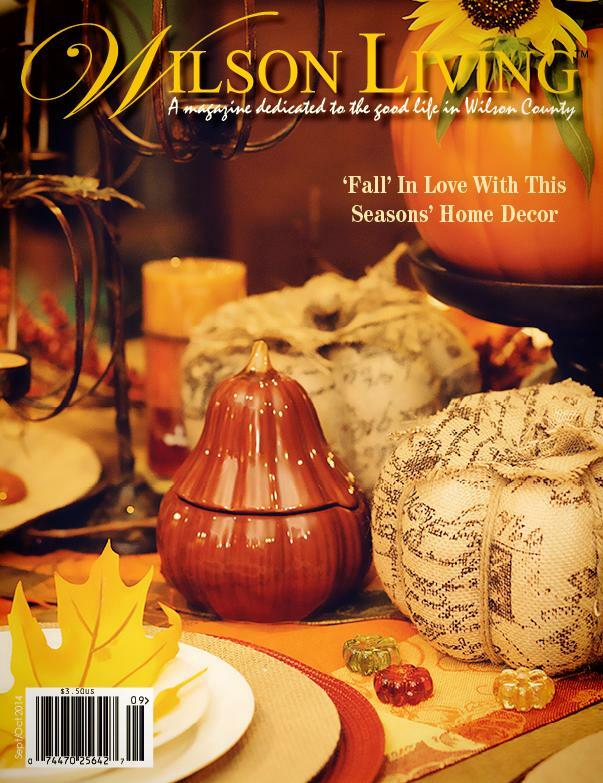 If you follow Wilson Living Magazine on Facebook, then you will recall a contest we ran last November. The thought was to include our readers in this column by helping you with your organizing and decorating dilemmas. 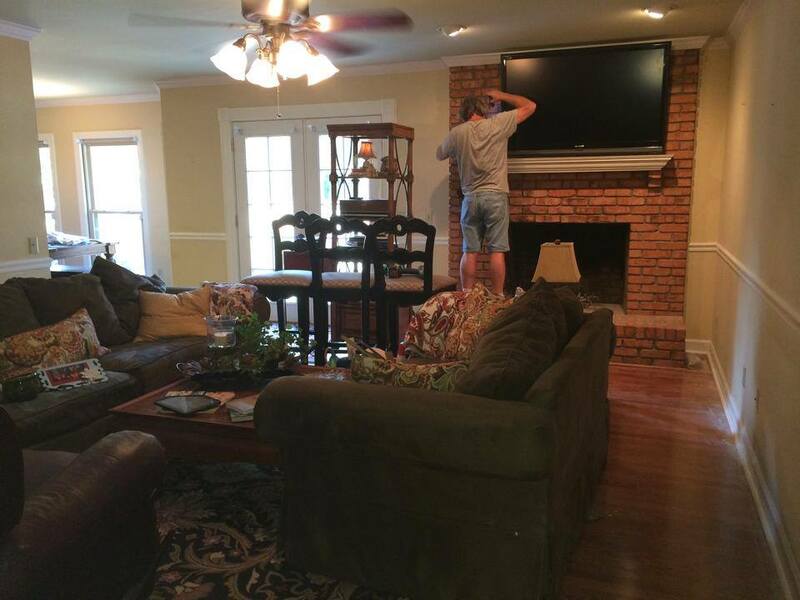 The issue I find many times when I visit with a client is not that they don’t have enough room, but that they are not getting the best use out of the room that they do have. 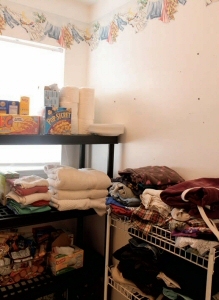 With less closet space, Fran was using her laundry room not only as a space for laundry, but a make-shift closet and pantry. When I arrived, I realized that she actually had ample space in her pantry for food storage. After some sorting and re- After some sorting and re-arranging, I was able to make her laundry room a space for clothing and shifted all the food to the pantry.arranging, I was able to make her laundry room a space for clothing and shifted all the food to the pantry. I also hung some family photographs and found a coat rack in the garage that made a perfect landing spot for her children at the end of the day. Now they have a space for coats and backpacks. She also has a space for sorting and folding clothes, and her pantry got Laundry nowa makeover as well. Thanks to Fran and her family for allowing us to feature her space in this column. If you would like to see more reader dilemmas, let us know. Next time I might visit you! When organizing your home, make the best use of your space by storing things where they belong and giving everything a home. It’s been said that the average person spends two months of their lifetime looking for things. I don’t know about you, but I want to spend those two months doing something else!